I live in New York City and there aren’t many Cubs fans that I’ve met here so far who are readily available to talk about the day’s Cub headlines or the most recent Cubs game. It’s great to have access to a community of baseball fans in general, but especially to be able to reach out and communicate with other Cubs fans on a daily basis. Until the Cubs hire me as a beat reporter/analyst, this is the closest I’ll come to either…and I love it! 2. What was your favorite post? My favorite post would probably be the one titled "The Face, The Brace, The Pace, The Place and The Ace" or "The Poster Child". The first one was one of those blogs where you feel like you have so much to say it just flows once you sit down and start typing. Those are exciting when they happen. The other one I just think is really funny…my own little parody of the Cubs upcoming ads for the 2008 team. Good times. The first time I received a comment because I couldn’t believe people were actually reading my blog. It’s made me post nearly daily lately with people responding and the feedback I’ve received regarding how many people are enjoying my page. 4. What is your favorite blog, including at least one MLBlog? There are couple that I was really enjoying yet can’t seem to find any longer which is too bad. I really like Crawly’s Cubs and Some Ballyard. A good mix of humor and analyst is what I really enjoy when reading someone else’s blog. And anyone who enjoys my blog…I generally read there’s regularly too. 5. What would you be doing if you weren’t blogging? Walking my dogs. They REALLY should be outside on a walk right now. 6. Where do you think the blogosphere is going? Blu-ray? I don’t know you got me. 7. Favorite team and why? Cubs. Chicago Cubs. Yes those Cubs. Great characters on the team, great potential, great history, great fans, great stadium, the seventh inning stretch, the underdog status year in and year out, wondering if this will be the year and how many more years I’ll be wondering if this will be the year…and Ryne Sandberg. He was the man. 8. What is one thing most people don’t know about you? …champagne all over your team’s clubhouse at the end of the World Series. I’d say that’s happiness indeed. Why did you sign up for an MLBlog? player is Grady Sizemore. That dude is out of control! the key to reading it. daily, but a couple that I’ve enjoyed reading so far are Leading Off and The Script "I" (I feel like this dude’s got something good going). Definitely watching the Indians win their first ever World Series game at Jacobs Field in ’95 with my Dad at my side. Epic night! Probably reading Summer of ’49 or hanging out with my beautiful wife. Well, it’s been quite a while, but tomorrow I’m going to buy myself a vintage Tribe fitted hat. I’m pretty excited about that. Who is your favorite MLB player? day and I respect that drive. Finding that one thing that gives your life foundation and purpose and passionately chasing after it with all you have. Click the Spheroids link on the side of this community blog, and check out the list of them going back a couple of years. You can find out more about your fellow MLBloggers and what inspires them to blog. Just email us your responses to the same Nine Questions that Seth answered (put "SPHEROID" in the Subject line), and — voila! — instant marketing for a blogger. ONLY AT MLBLOGS! instead of just going with my dad’s like I have in the past. more about them than he does and I just really love all the guys. They are great players and great people. to watch a baseball game than AT&T Park. coming in a close third. that big on TV but man is that guy huge. Studying. I really should do that more. love how feisty he is. best defensive shortstops EVER! 11 Gold Gloves. Most hits by a shortstop since 1957 with 2513. Most double plays turned by a shortstop with 1596. The man is simply amazing! MLBloggers and what inspires them to blog. Just email us your responses to the same Nine Questions that Aubrey answered (put "SPHEROID" in the Subject line), and — voila! — instant marketing for a blogger. ONLY AT MLBLOGS! To be honest, a few years ago, I would have said, "Baseball? Zzzzz." But then I read Moneyball, and everything changed; it’s like I saw the light. Now, having an MLBlog allows me to share my strange combination of passion for the A’s and my intense yearning to feed them sugary treats with others in the baseball (and non-baseball) community. Plus my boyfriend thinks it’s really hot that his girlfriend is into baseball, and all of his friends are jealous, too. The Oakland A’s. They’re young, attractive, and play good baseball. Plus, green and gold compliment my eyes; orange and black? Not quite. My mom taught me how to share at a young age (Well, except sharing with my sister Emily. That took a little extra time), and blogging with MLBlogs lets me share my baseball experiences with likeminded (and sometimes not likeminded) fans. Probably when Kirk Saarloos smiled and pointed at me (and/or at my cookies). *Sigh* At least I have another reason to visit my grandmother in Cincinnati! Marco’s home run off the left field foul pole earlier this season almost takes the cake, though. I was sitting about 15 feet away, and everyone, dejected moments earlier, jumped out of their seats and cheered like crazy. Well, except for those Yankee fans. I think they were sneering. I’d be creating a "who’s who in our lineup" guide. It’s great that all these new guys keep visiting our dougout. And playing. And scoring home runs. But I just can’t keep up with all of the changes! If I weren’t blogging or doing something directly baseball related, I’d probably be searching online for new bakeware. I really want to try a silicone muffin tin. Remember when silicone was only used for one thing? Those were the days. I bought a root beer during preseason at AT&T, and it came in a Giants cup (which of course I didn’t keep). If that doesn’t count, either tickets or a green hoodie. It’s a great hoodie, too. It keeps me warm on those brisk East Bay nights! …like a box of my chocolate chip walnut spice cookies. And knowing that your team has heart and facial hair. What’s even better than Becca’s yummy ballpark morsels or taking up-close pics like this one she captured below? Being a Spheroid! Click the Spheroids link on the side of this community blog, and scan the list of them going back a couple of years. You can find out more about your fellow MLBloggers and what rocks their worlds. Just email us your responses to the same Nine Questions that Becca graciously answered (put "SPHEROID" in the Subject line), and — voila! — instant marketing for a blogger. ONLY AT MLBLOGS! I signed up for an MLBlog because it is hard to talk baseball with anyone who has any real knowledge. I read the experts’ opinions and watch the games, but when I discuss it at work it seems to be…um…ignorance? I love the game. I love the Red Sox. But I love certain topics as well. A lot of the topics are a passion I have because the people I know make me angry when they criticize my opinion of the game. I am a Red Sox fan. I grew up in New Hampshire and have been a fan as long as I can remember. Although there was a period of time I acted like it was the Giants/Mariners, to be different from my immediate family. Actually I chose the Giants because my cousin liked them after they were swept by the A’s in the ’89 World Series. I chose the M’s because of Griffey. But deep down, I was always a Red Sox fan. Mike Greenwell was my favorite player when I was very young, then it was Griffey, then Nomar. It still is Nomar. I check almost every Dodgers box score to see how he is doing. My thoughts are scattered. I am one of the most random people one will ever meet. What goes on in my head rarely pertains to what is going on outside of it. This gets me in trouble sometimes. I lose focus, and it is hard for me to absorb information. Unless it is about baseball of course. So with blogging I can change topics quickly and it is accepted. Whereas with an article, you stay with the chosen subject. But my baseball thoughts are not quite as scattered, so you will see more structure with them than with any other blogs I write. My favorite blogger is Rob Neyer. I read his and Buster Olney’s blogs every single day. Neyer just started blogging. He was only writing and doing chats before. Olney’s is good too. On MLBlogs.com, I enjoy Coral Marshall’s West Coast Student Looking For East Coast Baseball Knowledge, The King’s Game, Brownie Points, Thurman Munson Should Be In The Hall, and others. I would say I have been to Fenway probably 20-25 times. I have been to many Spring Training games down here in Florida, where I currently reside. One moment I distinctly remember was when Brian Daubach hit a walk-off double when we were down one. Don’t remember who they were playing. But that moment was incredible. I saw Clemens face off against Griffey. Griffey had two doubles and two strikeouts, so I got to see the best of both of them. I saw a 13-inning thriller in ’03 between the Sox and Cards. Edmonds hit two homers including the game winning three-run homer in the top of the 13th, but Nomar had two game tying hits and two great defensive plays. And yes, when he was in his prime he was better than Jeter. As for not being at the game, my most memorable moments were the 2004 ALCS, of course. I was much more excited when they came back against the Yankees. The World Series that year was anticlimactic outside of Game 1. People call me crazy for that. But the comeback was simply far more fulfilling, in my opinion. What would be doing if you weren’t blogging? I would be on some other website that I am not as passionate about trying to pass the time. Out of the websites that I go to regularly, sports websites and my online banking sites are the only real productive ones. And to my favorite band Tool’s website, of course. Nomar is my favorite player. His work ethic, his clutch ability. I know I am biased, but the first half of ’03 there was no one I would rather have with the bat in his hands than Nomar with the game on the line. The guy was simply amazing. It is too bad he has been injured off and on for so long now. And too bad we traded him. I really don’t know that answer, for I have faced ordeals that inhibit me from truly enjoying things. But I am passionate about baseball. It fills the void for now. Want to be a Spheroid just like Joe? Just email us your answers to those Nine Questions and we’ll add you to the long line of Spheroids through the centuries who have gotten extra promotion right here. Please drop a comment on this blog as a heads-up to check that email if you do, because there are about 18,000 "Irish Lottery" spam messages in that Yahoo! account as usual. Thanks to Joe for playing along! don’t like? I also know about every player by name, number and face. doesn’t care about the Rockies at all. My favorite thing about blogging is when I write a post, people make comments on my blog. I love hearing feedback from other bloggers. Hmmm…. that’s a though one. I have some many good memories from Major League Baseball, but my favorite was a game of Jamey Carroll’s last season against the Pirates. He went 4 for 4 and had 2 amazing catches as he lead the Rockies to a win. I would be doing something else that has to do with baseball. I would be watching more baseball, reading about it or playing it. The last thing I got was a Rockies spring training t-shirt at Hi-Corbett field in the gift shop. I wanted to have a unique way to remember spring training and show I went. That would be Jamey Carroll. I am totally obsessed with him. He is my favorite player because he always hustles and is really fast. He is consistent with the bat and gets on base a lot. He is also an awesome fielder. I was very disappointed when the Rockies put him backup to Kaz Matsui. Carroll should be the starter! Winning a World Series. Winning the fall classic is proof your team is the best. Players and teams train year-round to win a World Series and once you get there, you can say your team trained the hardest and played the best out of all the teams. I originally signed up for a Yankees blog (pinstripepride.mlblogs.com), just because I love the Yankees, and I wanted to talk about them to anyone that would listen. I grew up in New England, so I didn’t have a lot of fellow Yankees fans I could discuss baseball with, so I wanted to try this option. After a while, I thought that my blog wasn’t standing out, due to the large amount of Yankees blogs, so I wanted to have one that would get some more attention. So now I write about anything in baseball that catches my attention. Any team or player is fair game. And at this time of year, since I’m in Arizona, I wanted to share my experiences at all the spring ballparks with everyone that is stuck up north in the snow. Once spring training is done, the focus of the blog will shift to anything worth talking about. The Yankees. A lot of people question how I became a Yankees fan, since I grew up in New England, but I have a decent explanation. When I was little, my father took me to a Red Sox/Indians game at Fenway. I was probably 6 or 7 years old. I just remember sitting there the whole time, listening to a small group of people talking trash and booing the Indians at every opportunity. As a kid that young, it left a bad impression with me, I just couldn’t understand how fans could be so mean. After that day, I hated the Red Sox, so it just made logical sense to support the Yankees. Of course, later on in life I figured it out that this stuff goes on in every stadium. And the fans that day weren’t particularly nasty, it’s just really easy to be influenced when you’re that young. So I no longer hold that against the Red Sox. But I’d already been supporting the Yankees for so long, and I wasn’t about to change. I don’t hate the Red Sox, I think the rivalry is great for the sport. Of course I want them to lose, but I’m not nasty about it. I like getting feedback from people visiting and reading my blog. It’s not always easy going to a spring game, taking a ton of pictures, and try to remember everything about the game, so I can write about it that night. When people tell me they enjoy my impressions, it makes it all worth it. There’s a lot of great and knowledgable baseball fans on this site, and to get praise from any one of them is an awesome feeling. I just hope people still enjoy it when the regular season starts and they no longer need me for my spring training pictures, haha. Does my own count? Just kidding. I enjoy Coral’s West Coast College Student Looking For East Coast Baseball Knowledge blog. She has a passion for the game, and it’s great to see someone that up such an interest in the history of the sport. She’s also really good at commenting on other blogs, which is nice, it helps build the community. I also enjoy the Diamondhacks blog, as he’s living in the same area I am, and it’s nice to read smart opinions on the local team, even though it’s not the team I support. Can I use two? I watched a little bit of the World Series in 1991, but my first big year of following baseball was in 1992. The following year, I got to see Joe Carter win the World Series for the Blue Jays, with that home run in game 6 against the Phillies. I was 10 years old at the time, and I remember being allowed to stay up late on a school night to watch it, and it was one of the most amazing things I’ve ever seen. That moment ensured that I would be a lifetime baseball fan. I was also a big fan of Roberto Alomar, who I idolized growing up. I can’t wait until he is elected to Cooperstown, and I will make sure that I’m there for the induction. As a Yankees fan, my favorite moment was when Aaron Boone hit the series winning home run in the 2003 ALCS against the Red Sox. The picture is on my desk as I write this. I was watching the game with a bunch of Red Sox fans, and having to listen to their taunting for most of the game, they were finally silenced in the 8th inning, and then I got to celebrate on that home run. I was acting like a 14 year old girl when it happened, I just couldn’t control myself. Well I have my teaching license for music, and I’m currently getting my master’s at Arizona State University. Once that’s done, I hope to be teaching high school music for the rest of my life. There’s nothing like teaching what you’ve been studying your whole life, and seeing the excited look on kids’ faces when they get what you’re saying. It’s the best feeling in the world. The last thing I got was a t-shirt at my latest Angels spring training game. I’ve been collecting shirts from each stadium I go to this spring, to help me remember my first spring training here in the Cactus League. Well like I mentioned earlier, Roberto Alomar is my favorite player of all time. That guy could do it all. It’s a shame about the whole spitting incident, because nobody ever said a bad word about him before that. He will go down as one of the best, if not the best, all-around 2nd basemen of all time. There was no part of the game that he didn’t excel at. I have a Robbie Alomar jersey of every team he’s played for, except for the White Sox, which I’m still looking for, and the Devil Rays, whom he only played for during spring training. If anyone knows where I can get those jerseys, they will be my best friend forever. As for current players, it’s Mariano Rivera, hands down. He’s the best at his position in the history of the game. He’s underrated, if that’s even possible. And not only is he amazing, but he manages to stay off the backpages. In an era where seemingly every player is involved in a controversy of some kind, Rivera has done an amazing job of being a consumate professional. The Yankees getting back to glory, the way they did 10 years ago. This year would be special, with all the young guys we have. We’re finally getting back to the way we were, focusing on the farm system, and filling the additional spots with players outside the organization. Instead of throwing money foolishly, we’re starting to make better decisions. I look forward to guys like Philip Hughes, Robinson Cano, Chien-Ming Wang and Melky Cabrera bringing us back to the top. And I’m of the belief that Alex Rodriguez does not deserve the flak he’s getting, and he deserves to be part of a championship team. I love to talk baseball — with friends, family, even random strangers. Here, I have an opportunity to write about the daily happenings around the league, with my team (the White Sox), how the season is shaping up, or just about any topic in general. I have something to say, and if people want to find me, now they know where they should go. I’ve been a White Sox fan since I knew what baseball was. It just goes with the territory — my entire family consists of White Sox fans, and it’s just been ingrained into me. If I had to choose a second, though, it would be the Boston Red Sox. I spent a year in Maine and really got to like the entire region, especially the sports in the area. When I got to go to Fenway last year to see the Red Sox and the White Sox play, it was like a dream come true. Having also done regular newspaper columns, I know how difficult it can sometimes be to write on command. With a blog, I can write as little or as often as I want — and my columns can be as short or as long as I need. With a newspaper column you only get so many inches, and sometimes it’s a stretch to fill it all — and sometimes you have to condense a large part of your work into a short bit. On my blog, I’m unedited — whatever I say, goes. Strangely enough, I don’t read too many outside blogs. However, I have to say that Bill Simmons’ recently created Basketball Blog is always entertaining. 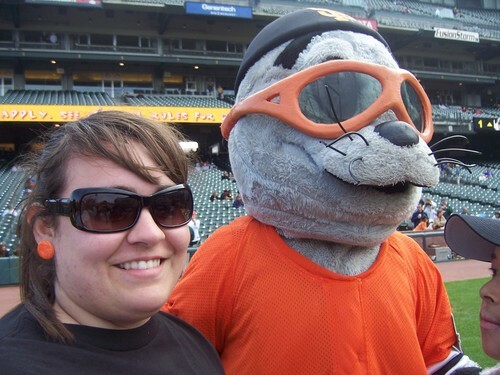 Here on MLBlogs, I’ve enjoyed reading the West Coast College Student Looking for East Coast Baseball Knowledge blog — Coral really likes her Angels, and always has something interesting to say. I don’t think she resents my White Sox fandom too much, either, despite the events of ’05. Last September, I took my first baseball road trip. 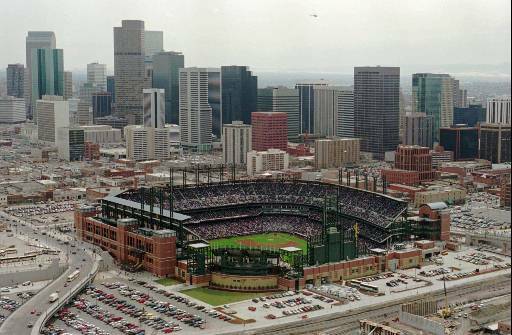 I started on the north side of Chicago at Wrigley Field, and saw games in Detroit, Philadelphia, Boston, New York, Cincinnati, Milwaukee, and finished up at U.S. Cellular Field on the south side of Chicago. We also got to see a day of tennis at the U.S. Open, which was happening during the days we were in NYC. It was amazing. This year we’re doing it again, but for a longer time — in addition to the parks we hit last year, we’re also catching games in Cleveland, Philadelphia, Baltimore, Washington, and St. Louis. I can’t wait. Well, being a professional musician when I’m not talking baseball, I’d probably be practicing. I work a lot, and when I’m not performing, I’m teaching, so it doesn’t leave me a lot of time during the day. But somehow I seem to still get everything done. Opening Day tickets to see the White Sox and Indians! For this, I have two answers. If you’re talking current, active players, I’m going to go with Paul Konerko. He has been the face of the White Sox for quite a few years now. I’d say a lot of people equate him with the "south side" mentality — a guy who worked his way up through the ranks to become a leader but at the same time does not allow himself to become complacent. He had a rough year in 2004, but followed that up with solid campaigns in 2005 and 2006, and that’s the hallmark of a great player — coming back and playing hard even though things may not have been going your way. I think the whole lineup of the White Sox exemplifies that — Thome, Dye, Konerko, A.J., everyone — they work hard and don’t take any B.S. As far as all-time players go, I’ve got to say Ted Williams. I’ve got plenty of favorite White Sox players, and plenty of favorite all-time players, but for some reason Teddy stands out to me. Here’s a man who not only was one of the best hitters of all time, but a truly honorable man to boot. He accepted his compulsory military service even though he knew that it would take him away in the prime of his career, and served his country honorably in a time of war. He was a stand-up man, and in a day and age when that type of person is hard to find, he is a great role model for those who follow him. Enjoying Opening Day with my Dad, who I will be taking to the park with me again this year. It’s become a tradition, and even though it wasn’t technically Opening Day for us last year (we went to the third game of the season because of our collective schedules), we’ll continue the tradition again this year. That’s why I’m hot: Want to be a Spheroid like Michael and get all Mims about your own MLBlog? Just email us your answers to these Nine Questions and put "SPHEROID" in the subject line, and we encourage you to include any links and images you’d like to see included. Then we’ll show why your blog is hot. Here’s what you need to know about Steve, the guy behind the quickly popular My Brewers MLBlog out of Oshkosh, Wis.: He decides his favorite players mostly on character; his main wish for 2007 is for his favorite bunch of guys like Bill Hall (L) and Prince Fielder (R) in the above photo to be "consistently competitive"; he was there when a Brewer collected his 3,000th hit and it wasn’t Bernie Mac; and don’t get him started on a Cubs rant. We appreciate him taking the time to answer the Nine Questions here and step up as our latest Spheroid here in The Show, so please get to know another fellow MLBlogger and drop by his page with some comment love. I decided to sign up because I thought it was a great way to express my feelings about the Brewers and have it read by more than just friends and family. The idea that, eventually, large numbers of Brewer fans will be reading and responding to what I have to say is pretty cool. I also liked the idea that there were players, broadcasters and legends of the game out there blogging, and potentially reading my blog just as I read theirs. My favorite team is, obviously, the Chicago Cubs. Hahaha…NO WAY…not in a million years! I despise the Cubs and their fans. I enjoyed watching children, and adults for that matter, crying when the Marlins knocked them out in 2003. I mean I thoroughly enjoyed it…and every Brewers fan should have because they would have heard the same if the roles were reversed. As a Milwaukee Brewers fan, they went from being a harmless National League team that the American League Brewers would never have to face, to an opponent today. With the switch to the NL, feelings have shifted from the South to the North Side of that awful city to the south of us, although the White Sox are only one notch above the Yankees as my least favorite AL team. But back to the original point: the Milwaukee Brewers are my favorite team. Why? Because I grew up in Franklin and Hales Corners, Wis., and it was the right thing to do. I am a homer, plain and simple. I cheer for the Brewers, Packers, Badgers, Bucks, Warriors (Marquette, that is), and any other team that is from the fair state of Wisconsin. As far as specific Brewer teams that are my favorite, I’d say it’s a tossup between the ’82 (photo here shows that ALCS clincher! ), ’87 and ’92 teams (big shockers). I am hoping the ’07 team makes that list too! Being able to express my feelings and have everyone that’s interested read them at their convenience. I talk with my coworkers Doug, Rory, and Nick at work, e-mail with buddies Brad and Jeff, and talk with my best friend, Mark (even though his attitude about the Brewers is that they never have and never will win anything), my dad, Don, cousins Mark and Tony, and various other people I see every once in a while (Rick, Ted, etc. ), but with the blog I am able to give my opinion without having to repeat myself 13 times. When I see these people they will already know what I am thinking and we can just concentrate on their side of the story, unless, of course, they post responses. Then when I see them we have to talk about other things. OK, maybe this blog thing isn’t such a great idea! The other part that is great for me is the ability to write about sports. As a kid I always thought it would be great to be a sports reporter. Blogging gives me an opportunity to do it for fun and live out that dream…kinda. Who knows, maybe if I get polished enough, the Brewers will find a place for me on their payroll writing for them in some capacity. My favorite blog outside of the MLBlogosphere is Life In the Office about my favorite television show, "The Office." In my opinion, it is the best show on television nowadays (with ’30 Rock’ making a solid run at it). The blog really posts some great stuff about the show. I don’t have to search the Internet for anything, it does all of the work for me! In the MLBlogosphere, I would have to say that there are three at this early stage of my MLBlogging career: Brian Anderson, the FSN voice of the Brewers; Fans On The Field by Dan Mathers, a huge Red Sox/MLB fan with a Boston edge; and The Brewer Nation by South Side Rob and Big Rygg, a couple of guys who really know their Brewer Stuff and have the stats to back it. Being at Robin Yount’s 3,000-hit game was probably the best baseball moment I have seen first-hand (although watching Steve Kiefer hit a grand slam off Scott McGregor, and then Paul Molitor hit a solo shot in the bottom of the ninth to win a game against the Orioles, 9-8, in August 1987 was probably the best non-history-making live baseball memory, as odd as that sounds). I’ll be posting later this season to commemorate the 15-year anniversary of that great Yount/Milwaukee County Stadium memory. There have been so many others that have unique stories that come along with them. Each of the stories will help to build my blog and add a fun element to it. editing, since I try to do it right the first time, so it really doesn’t cut into anything else I do. I like to sit in my recliner with my laptop on my lap while I watch games, so now I can be productive while doing that. Honestly, I really don’t spend much money on anything, so it may go all the way back to last July 4 when I bought a new Brewers hat before going to the game with my wife, Amy, and my parents, Don and Jan, against the Cincinnati Reds. (It happened to be Hot Dog Racing Sausage Bobblehead Day.) And come to think of it, Amy actually bought me the hat for my birthday since it is on July 6…so I really don’t know what to tell you on this one! My favorite current MLB player is probably Chris Capuano. Much of this can be attributed to the fact that I am an avid listener of a radio show out of Milwaukee called "Bob and Brian in the Morning" and he is a weekly guest. It plays on local affiliate 96.9 The Fox, which is based in my current hometown of Oshkosh, wis. I think the reasons I selected Cappy are: 1) I can’t choose anyone on any other team, 2) He comes across as a really good person and is pretty funny when he is on the show with them, and 3) He is the best starting pitcher on the Brewers right now (apologies to Ben Sheets). Character is very important to me when deciding whom to cheer for. As a matter of fact, there have actually been Brewers that lacked character that I rooted against (i.e. Gary Sheffield). That is one of the reasons that I love the Brewers; they always seem to have high-character players (money probably has a little to do with that, huh?). My all-time favorite MLB player is Yount, hands down. I could go on for days explaining why, and will do so as I write the blog. To summarize, though, everything I said about Capuano applies to Yount tenfold. The Brewers being consistently competitive. That’s all I ask for. I can’t take another stretch of years like the late ’90s/early ’00s. I want them to be competitive so they give me something positive to talk about all season long, every season. Don’t get me wrong, I would LOVE a postseason appearance and, dare I say, winning the whole thing sometime before I die, but I don’t want to get greedy and upset the baseball gods. So I’ll start with a small request for my happiness! Please add My Brewers to your list of other blogging friends and visit there often this season. If you would like to be a Spheroid and make more people aware of what you’re doing here, feel free to drop us an email with the word SPHEROID in the subject. Happy Blogging!